Kids are just as busy as their parents these days. They juggle school, extra-curricular activities, friends and homework. Just like adults, kids need rest after a long day. Why Kids Need Sleep Sleep affects your child’s physical and mental health, and not getting enough sleep can lead to problems in your child’s overall health as they grow older. Sleep promotes learning. Lack of sleep can make it hard to pay attention in class and to follow directions from teachers, parents and coaches. Sleep boosts the immune system. If your child isn’t getting their recommended hours of healthy sleep it can make your child more prone to getting ill.
Sleep promotes growth. Growth hormone is released when your child sleeps. Over time, a lack of sleep can have a significant effect on a child’s ability to grow in height. Bedtimes Bedtimes are important and they do help your child function better. School-aged children need between 8.5 to 10 hours of sleep, depending on their age. Even though enforcing a consistent bedtime can be difficult, it’s important as parents to keep our kids on a regular sleep schedule. Plan a bedtime that allows your child to get the recommended number of hours of sleep a night and maintain it. Develop a bedtime routine with your child. This will help them take ownership of the process. Allow for wind-down time before bed by turning off electronics an hour before and making sure to keep cell phones and other electronic media out of the bedroom. Make sleep a family priority, emphasizing that if the whole family gets enough rest, everyone will feel better and behave better. 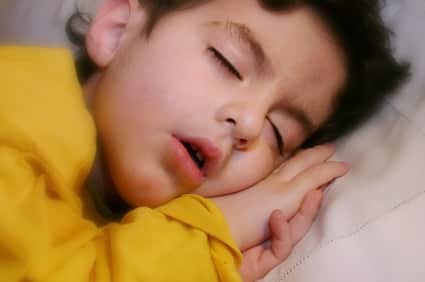 If your child has been a poor sleeper; not been able to fall asleep or stay asleep for a long time, you as a parent, can become exhausted and end up merely trying to cope. Being in “cope mode” does not change the situation, and everyone ends up suffering. Take the courage to stop, zoom out, acknowledge that there is a problem and seek help. Everyone will be the better for it. If you have any concerns about your child’s sleep behavior or health, it’s important to contact your pediatrician and share your concerns about sleep deprivation. Your child may benefit from a sleep clinic consultation or sleep study. The Stramski Children’s Developmental Center at MemorialCare Miller Children’s & Women’s Hospital Long Beach provides comprehensive care for children — from birth to age 21 — for behavioral and developmental conditions, including sleep conditions. Miller Children’s & Women’s offers pediatric sleep specialists, sleep studies and a family centered environment where the care team partners with families to identify and manage sleep disorders. For more information on sleep health, visit millerchildrens.org/stramski.